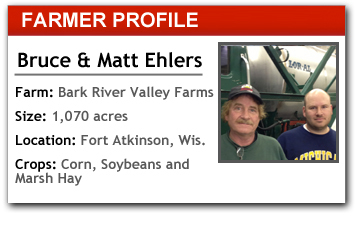 Simplicity drives Bark River Valley Farms near Fort Atkinson, Wis. Father-son team Bruce and Matt Ehlers closely weigh the benefits of adopting technology with its cost, and they have found a way to simply and economically leverage precision farming equipment in their operation. They farm 1,070 acres, no-tilling corn and soybeans on hillier, rocky ground and conventionally till the rich bottom ground in their Bark River Valley fields. In flood-prone areas near the river, they grow marsh hay for sale or as feed for their cattle herd. The Ehlers rely on simple Outback Guidance units that guide them while spraying, applying fertilizer, planting and occasionally, doing tillage. The sprayer is also outfitted with a Raven SCS 440 Automatic Controller. “When it’s working, it is great, but its performance last year was erratic. We haven’t been able to figure out why it cuts in and out,” Bruce says. “Matt, who also works for a trucking company, is very familiar with this type of technology, and it’s frustrating when it doesn’t work right.” They appreciate the dealer’s efforts to replace suspected defective components, but they have yet to pinpoint the problem. For planting, they have outfitted their John Deere 4960 with an Outback eDriveTC auto-steer package that’s controlled by one of the Outback S2 units. “It’s not sub-inch accuracy, but close enough for us. Besides, when we are planting contours, I prefer to use the row markers,” says Matt. On top of using Wide Area Augmentation System (WAAS) location from satellites, the units can also receive positioning information from their AgJunction GPS base station. “We are within 6-inch accuracy, which is good enough for us. We know we can’t drive that accurately,” says Matt. The Ehlers were told to reset the units so they could locate another set of satellites to draw a signal, but it took more than 20 minutes to reset. “It would have been nice to know that was the problem in the first place and we would have if the dealer had called or contacted us,” Bruce says.